Atlantic salmon fly-fishing conditions on the Miramichi River at McNamee as of Sept 17th . The Ruckno gang pictured here fished up until Sept 14th with mixed results but again a very successful trip according to party chief, “The Rev.” . The water has dropped off a little more since the 14th and the fish are still in the jumping mode . We have tried every fly in the book but it is still slow going and will probably remain so until these “fall fish” decide to turn on , which they always do. There are a few fresh fish but obviously the big fall push is not on yet . Small flys with long leaders is a suggestion and of course a good bomber presentation will work too. As for the weather , it is absolutely beautiful being on the water , it is sunny and only +15C. with very little wind and the fall colors are beginning to show . Fish on the line or not it is still the best time of the year to be on the river . Atlantic salmon fly-fishing conditions for the Miramichi River at McNamee as of September 12th . The water is holding perfect and there are fish in every holding pool . We are starting to see more big fish in the 20 – 30 pound range but unfortunately they are taking slow . The fish are in the jumping mode , which is not unusual for early September but will soon switch to the taking mode as they begin the fall move in preperation to spawning time ( late October ) . All fish taken this week were on everyones favorite fly , the green machine with white calf tail . If the water stays normal height and clears up a little more we will start using more small black flys again . The long range weather forecast is calling for a little rain and moderate temps so hopefully the river will not get too cold before the big fall fish turn on . Anglers , keep the faith , we always have this little slow period with fish jumping eveywhere but taking slow , then it suddenly turns on . 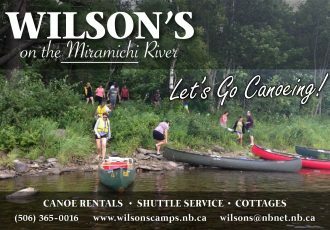 Atlantic salmon fly-fishing conditions for the Miramichi River at McNamee on August 19th . Big question, what does all this high water mean for our upcoming fall run . The picture posted today shows a tiny spring that always dries up by early July . This high water is the same for all brooks and swamps that make up the Miramichi watershed . Normally a guide on this river is never one to complain about extra water , but we are concerned about what this means for our fall run . Over the last three or four days we are seeing more and more fresh -run salmon travelling and now that the river height is getting down to what would be considered a good June level , anglers in the upper river pools can expect good fishing from now on . As the water drops off to a normal late summer level we are predicting the entire river system to really turn on for the fall . We hope the “fall run ” will come in on normal schedule and all camps and guides have an excellent fall .